For its artistic collaborations, Impossible Works will provide all kinds of vintage Polaroid cameras, amongst them one of the unique and rare Polaroid 20×24 cameras. The first 20×24 Polaroid camera was built in 1977 based on the design of Dr. Edwin Land, founder of Polaroid. 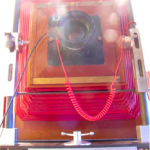 These cameras weigh over 200 kg, are made of wood, and produce large format instant film images (20 x 27 1/2 inch) of such quality, that even upon close inspection do not show any film grain. In 2011, only seven of these cameras still exist; five of them are still being used. Jan Hnizdo, an acknowledged photographer and former 20×24 camera operator for Polaroid made this unique camera available for Impossible Works. Impossible Works will make this camera as well as the new generation of 20×24 Impossible integral film available to instant artists all over the world, continuing the former Polaroid Collection principles. Impossible Works will make Impossible instant film materials available to photographers: the small format with the classic white frame, as well as large format films: 4×5 inch, 8×10 inch and 20×24 inch (supported by the 20×24 Holdings LLC in NYC). These new generation instant films are invented and manufactured by Impossible in the former Polaroid production plant in Enschede (NL). Download the Impossible Press Release to learn more.